No matter what you drive at some point it is going to need to receive proper maintenance as you rack up the miles. Preventative services are the best measure in order to get a long, healthy life out the vehicle. As parts wear out they will need be replaced, and this happens on every vehicle system including the suspension, exhaust system, power steering, cooling system and throughout the engine and transmission. Our certified technicians are trained to service the most modern vehicles and they have access to state of the art tools in order to do so properly. When you need domestic vehicle maintenance or auto repair in Austin make an appointment with Oak Hill Automotive today! We service all brands from General Motors using the finest replacement parts available. If you need factory maintenance or complex repair for your Chevrolet, Cadillac, GMC, Oldsmobile, Saturn, Buick, Hummer or Geo you can trust our expert technicians to get the job done fast and affordably. Ford is one of America's oldest auto manufacturers and continues to have a huge presence in the automotive market. We service all Ford cars, trucks, vans and SUVs as well as Ford subsidiary brands such as Lincoln and Mercury. Our technicians can service any brand under the Chrysler umbrella, including Dodge, Plymouth, RAM and Jeep. For any vehicle we can perform routine oil changes and maintenance or conduct complete engine rebuilds, transmission service or brake repair. The technicians at Oak Hill Automotive continually train in order to be able to service domestic vehicles straight from the dealership. Whether you need radiator repair, a tune up, exhaust repair, or check engine light diagnostics, we can do it! We are committed to the highest standards of customer service and auto repair. The next time you find yourself stuck on the side of the road don't hesitate to call our highly skilled team to get the problem dealt with quickly and correctly. 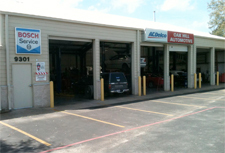 Call at Oak Hill Automotive today to schedule an appointment for superior domestic auto service in Austin.